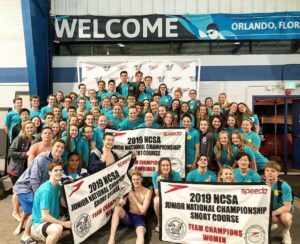 Day 3 of the NCSA Junior National meet will have the finals of the 200 free, 50 breast, 400 IM, 50 fly, and the 400 free relay. 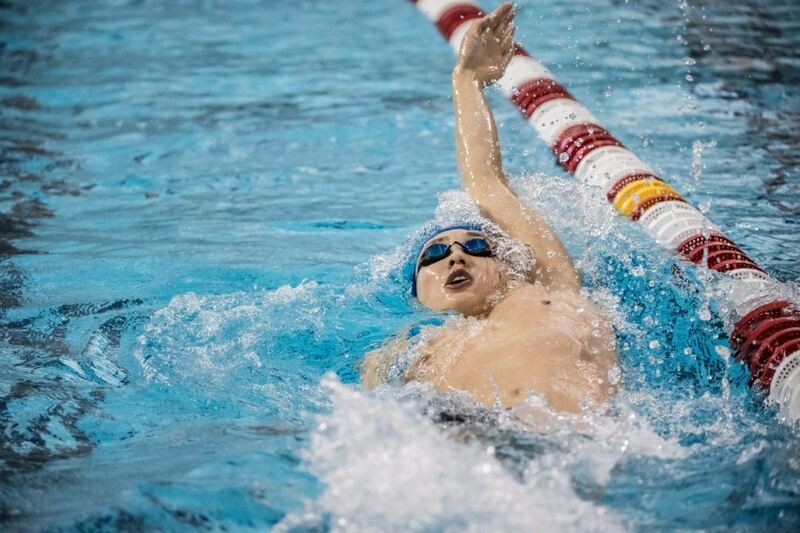 Coming back tonight for a second victory are top seeds NASA Wildcat’s Luke Maurer (200 free), Arlington Aquatic’s Torri Huske (50 fly), and Mason Makos’ Anthony Grimm (50 fly). Grace Sheble will be appearing in both A-finals of the 200 free and 400 IM, potentially aiming for 2 victories tonight. Grimm also joins St. Charles’ William Myhre and Team Pittsburgh’s Joshua Matheny in the 50 breast after the trio faced off in the 100 breast. Grimm emerged victorious in the 100 breast last night with Matheny and Myhre finished the top 3 behind Grimm. 1000 free champ Paige McKenna will have a chance to battle top seed Long Island’s Chloe Stepanek in the 200 free while Anna Keating looks to score another breaststroke victory in the 50 breast against top seed Baylor’s Cecilia Porter. 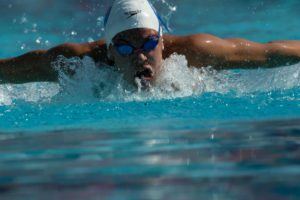 Continuing her winning streak at this year’s NCSA meet is 16-year-old Torri Huske. Her fabulous underwaters gave her the advantage throughout the race to hold off the rest of the field. 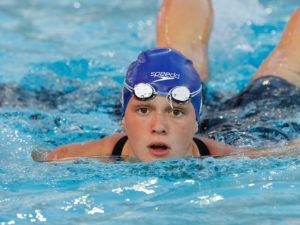 Huske’s personal best time now puts her in the top 100 all-time in the 15-16 age group. Taking second was Long Island’s Chloe Stepanek and third went to Cal-commit Rachel Klinker. 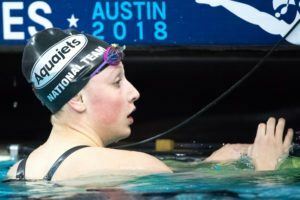 Also swimming under the 2019 Junior National cut of 1:47.39 was Greater Tampa’s Ella Bathurst and NCAP’s Paige McKenna. C-Final winner Sydney Whiting of NOVA swam a personal best of 1:47.43, which would have placed 6th overall if she were in the A-final. B-finalists Rachel Stege (1:47.62) of Fox Valley and NC State-commit Katelyn Mack (1:47.66) would have also placed in the top 8 overall. Jack Dolan snagged his first win of the meet in the 200 free with a season best of 1:35.38, holding off Zachary Hils and Luke Maurer. 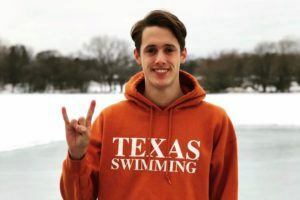 Although moving up in the top 100 for the 17-18 age group, Dolan’s personal best is still 1:34.78 from when he was 16. Future UGA-Bulldog Zachary Hils finished in second while Luke Maurer took third, both with personal bests. 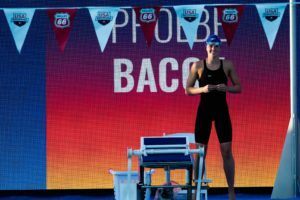 After taking second in the 100 breast on Wedneday, Hannah Bach came back vengeful and topped the 50 breast. The Ohio State commit finished just 0.06 seconds ahead of top seed from the morning Cecilia Porter. Taking third was 100 breast champion Anna Keating, who also swam under 28 seconds. NCAP’s Phoebe Bacon won the B-final with a 28.11, which would have placed 6th overall. 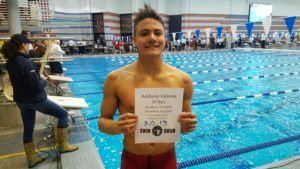 Showing off his sprint versatility is 16-year-old Anthony Grimm, who topped the podium once again in the breaststroke. 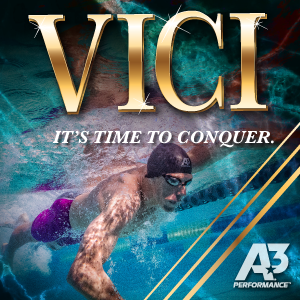 Later tonight, Grimm will be featured in the 50 fly final, where he is the top seed. Taking second place was William Myhre, who finished 3rd to Grimm in the 100 breast and now 2nd in the 50. Both under 25 seconds as well, third place-swimmer Paul Kinsella topped 100 breast runner-up Joshua Matheny. After taking 8th in the 200 free, Grace Sheble came back and was the only swimmer to break 4:10 in the event. Sheble’s personal best is a 4:06.35, the 8th-fastest time in the 15-16 age group. Felicia Pasadyn had a huge drop to crack the top 50 times in the 15-16 age group. Taking third place was Florida-State commit Sydney Vanovermeiren, who also had a big time drop from prelims. Winning the B-final was Abigail Harter of NCAP, whose time of 4:12.64 would have placed third overall. 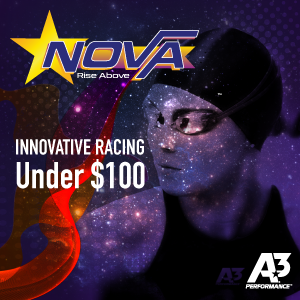 Taking fourth in the B-final was 14-year-old Zoe Dixon (NOVA), whose 4:16.72 time just cracked the top 50 times in the 13-14 age group. Taking a dominant win from the back half to achieve the senior national cut was future Cal bear Jason Louser. The rest of the top 3, UVA-commit Sean Conway and Naval Academy’s Bernhard Christianson also broke the 3:50 barrier. Cracking the top 100 times in the 15-16 age group was 6th-place finisher Hunter Locher of NOVA, whose time of 3:52.59 is now #62 all-time. Going 2-for-2 tonight was Torri Huske, becoming the only swimmer to break 23 seconds. Huske also won the 100 free on Wednesday. Taking second was UVA-commit Alex Cuomo, dropping nearly a second from prelims. Phoebe Bacon, 200 back runner-up, took third place to also break 24 seconds. Out of the D-final, 12-year-old Levenia Sim of TNT Swimming swam a blistering 24.90, which is the 5th-fastest ever 50 fly swam in the 11-12 age group. Also joining Torri Huske for 2-for-2 victories this session was Anthony Grimm, popping a 20.73 in this event. Grimm’s underwaters were unbeatable, and he took only 9 strokes the entire race. Grimm now has wins in the 50 breast, 100 breast, and 50 fly this meet. ASU-commit William Rose took second in the race while Auburn-commit Aidan Stoffle took third in the race. The rest of the top 7 swimmers were all under 22 seconds. Having a comfortable win in the 400 free relay was the NCAP quad of Carly Sebring (50.37), Phoebe Bacon (48.73), Caroline Bentz (48.95), and Katelyn Mack (49.65) with a 3:17.70. The Aquajets relay took second while the Fox Valley relay took third. The fastest lead-off of the evening came from 100 free runner-up Grace Cooper, who led the Delta relay with a 49.06. In the finals of the 100 free, Cooper swam a 49.03. 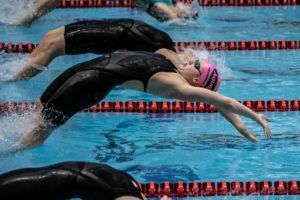 Two teams from Illinois, Fox Valley and St. Charles, duked it out for the top spot in the 400 free relay. The Fox Valley team was propelled by lead-off Brian Daugherty (45.93) and a pair of 44s from Aayush Deshpande (44.55) and Connor Boyle (44.10). Fox Valley anchor James Senese (46.50) was able to hold off St. Charles’ anchor William Myhre (44.19) to out-touch the squad by less than two-tenths. The fastest lead-off of the evening went to West Virginia-commit Joseph Armstrong, who led the Canton City Schools relay off with a 45.04.
the time was faster than 11 of the 16 finalists (in the medley relay) at NCAAs last year. and they had flying starts. Absolutely insane time. And Cuomo and Bacon with serious speed too.